Bike tire tubes stretched between a couple of used furniture legs create this functional and handy shelving system, which also happens to look pretty sweet. 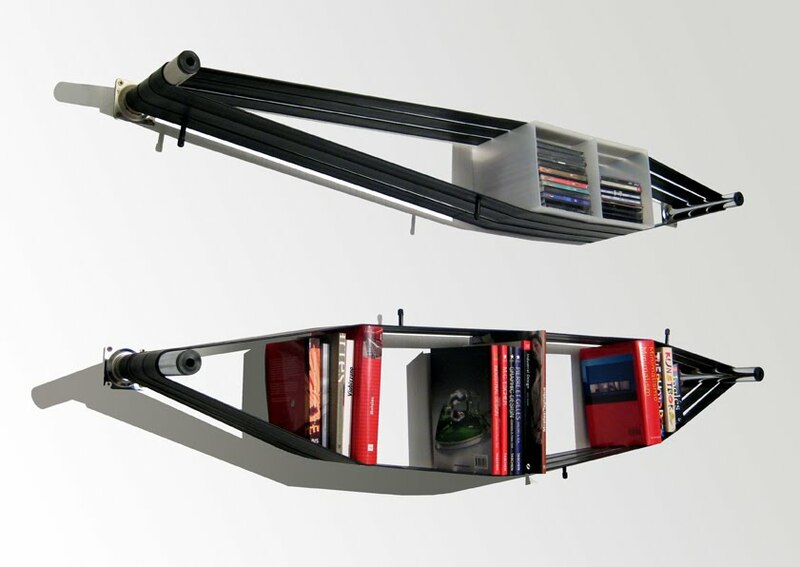 For the lover of all things cycling, the ElasticShelf by SystemDesignStudio uses the tension created by the stretched tubes to keep books and other objects fixed in place. Books of varying heights can all be displayed together on this creative shelf, which would be super simple to create at home. All you need are several punctured bike tire tubes of the same length and a few pegs to attach to the wall. This clever design was submitted as an entry into our Spring Greening Competition challenging designers and crafters to take an old piece of junk and transform it into something cool and new. If you’re feeling the ElasticShelf, vote for it here now! Expandable - elasticshelf! It would fit right in my condo. Bike tire tubes stretched between a couple of used furniture legs create this functional and handy shelving system, which also happens to look pretty sweet. For the lover of all things cycling, the ElasticShelf by SystemDesignStudio uses the tension created by the stretched tubes to keep books and other objects fixed in place. Books of varying heights can all be displayed together on this creative shelf, which would be super simple to create at home. All you need are several punctured bike tire tubes of the same length and a few pegs to attach to the wall. This clever design was submitted as an entry into our Spring Greening Competition challenging designers and crafters to take an old piece of junk and transform it into something cool and new. If you're feeling the ElasticShelf, vote for it here now!